Are you looking for an apartment to call home in Frederick, Maryland? Prospect Hall has it all. Our elegant Maryland community offers beautifully designed one- and two-bedroom apartment homes spanning 762–1,254 square feet. Each home is perfectly appointed to give you the living experience you deserve. Live in luxury at our pet-friendly apartment homes and enjoy a variety of unique features including a loft, cozy fireplace, and open layouts. Modern kitchens boast premium appliances, and built in bookshelves, spacious closets, and extra storage space make it easy to find a place for everything. Be sure to view our pet policy to learn more about our pet-friendly options. 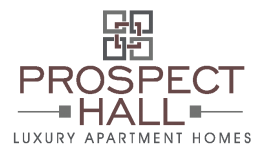 Prospect Hall is more than just an apartment to live in. Impressive community amenities set Prospect Hall apart from the competition and let you enjoy opulent living just steps from your front door. Unwind in our grand clubhouse with endless entertainment options. Work out in our 24 hour state of-the-art fitness center, kick back and watch a movie in the media theater room, relax in the sparkling resort-style swimming pool, walk your furry friend in our Bark Park and much more! Prospect Hall is located only minutes from Historic Downtown Frederick so you can enjoy all the perks of city living without sacrificing the serenity of a lush neighborhood atmosphere. Our Frederick community also offers convenient access to several major highways and is just minutes from a nearby MARC station so you never have to worry about rush hour again! Close to home you can enjoy premium shopping and dining at Prospect Plaza or grab a bite to eat just minutes away at Dutch's Daughter. Hood College makes educational pursuits easy and convenient. Enjoy the outdoors at Overlook Park less than five minutes from your front door. With so many great features in an amazing location, you can stop searching and start living in luxury. Apply online now or visit us today to begin the process of making Prospect Hall your new home.